It’s Just A Level Two… Let It Go! 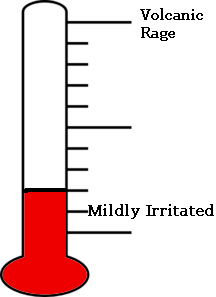 So many minor disturbances turn into full-on high conflicts with high energy anger, defensiveness, and intimidation. All because one partner was mildly disturbed by something said or done by the other partner; and the accused partner felt compelled to comment, defend and fight back. All because of a level two comment by the partner. This should not happen. Please, allow level two or three degrees of energy of disturbance from your partner!! Gee Marc, that’s great advice but you left out the part where we have control over how reactive we get when we hear our partner’s angry, irritated & disturbed ‘tone of voice’; even at a level three. 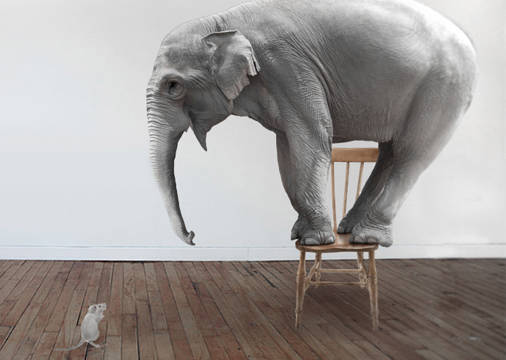 The Pic– of the elephant on the chair, scared of a mouse. It’s just some energy of your partner’s irritation. Mindfulness– As you get skilled in mindfulness, you learn to let go of disturbing thoughts, feelings and sensations. Another Mantra– No matter what you’re hearing in your self-talk, say these words in your head, “I love you.” It matters not whether the phrase is directed toward your partner or toward yourself. These are extremely powerful words. It may seem too simple or trite to say these words to yourself. But, if you experiment with saying these words to yourself when hearing mild disturbance from your partner; notice that it might just work fine to keep you resilient and calm.